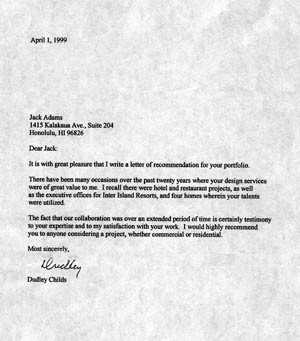 It is with great pleasure that I write a letter of recommendation for your portfolio. There have been many occasions over the past twenty years where your design services were of great value to me. I recall there were hotel and restaurant projects, as well as the executive offices for Inter Island Resorts, and four homes wherein your talents were utilized. The fact that our collaboration was over an extended period of time is certainly testimony to your expertise and to my satisfaction with your work. I would highly recommend you to anyone considering a project, whether commercial or residential.